Prom (promenade) is a semi-formal dance or gathering of graduating high school students. It is a celebration of hard work and friendship these teens underwent during their four years at the high school. The term ‘prom’ comes from the word ‘promenade,’ meaning a march of guests into a ballroom to announce the beginning of a formal event or ball. This event is typically held near the end of the year for the Grade 12 students. 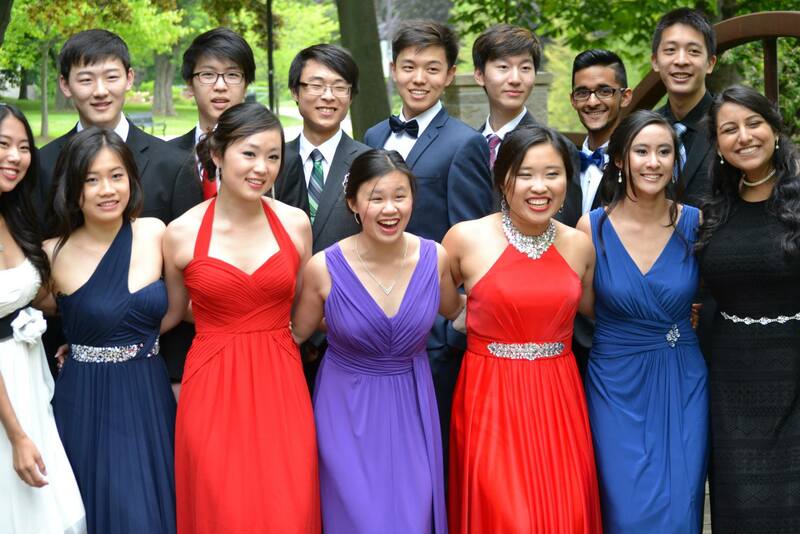 Prom is a major event among high school students and is believed to be the most important teenage event in Canada. Many teens feel this event to be an important event in their life, next to their wedding. In the early 1900s, prom was a simple tea dance where high school seniors wore their Sunday best. In the 1920s and 1930s, prom expanded into an annual class banquet where students wore party clothes and danced afterward. In the 1950s, proms became more extravagant and elaborate, moving to hotel ballrooms and country clubs from the school gymnasium, bearing similarity to today’s proms. With this, competition blossomed, as teens strove to have the best dress, the best mode of transportation, and the best looking date. In 1975, President Ford’s daughter Susan held her high school’s senior prom at the White House. 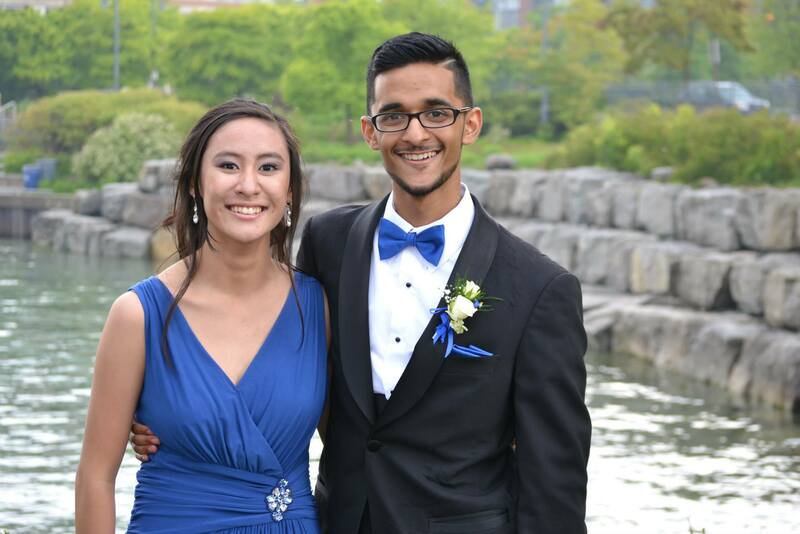 Our son Nikhil attended the Prom in June 2015 with his date Vivian Elizabeth as both were graduating from Grade 12. The preparation for the event started in full earnest in May after Vivian accepted Nikhil’s proposal to be his Prom Date. This event is called a ‘Promposal’ and can mimic marriage proposals. Nikhil with a bouquet in his hands, dropped down to one knee, and proposed to Vivian to be his Prom Date. Many of Nikhil’s friends did come up with creative methods for Promposal. Some did a ‘Bhangra’ with a ‘Dhol’; some sang a song duly supported by chorus of friends; some proposed with flowers and special cup-cakes; some had flash-mobs; some had special T-Shirts with a message and the list is endless. With these creative methods, teens are making each other feel special. This trend can be attributed to the power of social media and every teen want to post something special about every important event and promposal is really important. Nikhil wanted to wear a tuxedo for the event and we went to the store renting tuxedos to pick up one suiting him. He did not want to invest in the costly outfit as he realised that he is hardly ever going to wear it after the prom and in all probability will outgrow his tuxedo soon. He had to procure a bow-tie and a pocket square in Royal Blue colour to match with Vivan’s dress. Two days before the event, Nikhil visited the barber for a stylish haircut and also procured a set of perfumes and creams to wear on the prom day. He went to the florist and placed an order for a corsage for Vivan. The boutonnières to be worn by the boys are procured by the girls. The entire exercise cost us around $400. When our daughter Nidhi had her prom seven years back, it cost us around $600. In case of girls, they got to buy their evening gowns and the jewellery to go with it. They got to get a pedicure and a manicure done, got to do up the nails, put on an apt facial makeup and also get a hairdo for the occasion. All these cost handsomely and all appointments have to be booked well in advance and the father got to get her to each place well before the appointed time. On the day of the prom, prom-couples gather at a park, garden, or their own and their dates’ houses for single and/or group photographs. In Nikhil’s case (and also Nidhi’s), the location for the photo-shoot was the Rhododendron Gardens located at Port Credit on Lake Ontario. The Rhododendron Gardens as the name suggest has about 60 different hybrids of Rhododendrons and are in full bloom by late June, as if to coincide with the high school proms. The park has a micro-climate that suits rhododendrons because of its acidic soil, the humidity from its exposure to Lake Ontario and its tree cover, which includes many white pine and oak. At the park, the prom couples gathered by 3 PM, exchanged the corsage and the boutonnière and after the photo-shoot, which took about three hours, proceeded to the banquet hall for the dinner and dance. The dinner and dance is organised by the school and is supervised by a few teachers. The mode of transport for prom couples is another important aspect as everyone wants to make a grand entry. Normally the parents drop off the children to the venue. Some hire limousines for the event. One Nova Scotia student rented a helicopter for around $2000 to make a grand entry. One teen showed up in an ambulance as a ‘Sleeping Beauty’, to be kissed by her prince charming to wake her up (she later had to apologize after a severe social media backlash). The teens outdo each other by showing up to prom in vehicles such as fancy cars, horse chariots and even ox-pulled carriages. The grand entry to the prom party will remind you of the Oscars. It is a red-carpet moment and the boys and girls really feel like a prince and a princess. It has all the glamour, glitz, camera flashes, etc. After the dance and dinner, group of friends congregated at a student’s home for the after-party. Some moved from one after-party to another and we picked up Nikhil the next morning. Since high school prom only happens once in a teen’s life, many feel it worth investing in it. Every teen wants to look back on pictures and remember the fun they had and how it was a night they felt and looked at their best. Everyone wants these memories to last forever, so they want to make sure they are the best ones. High school prom with all its glamour surely contributes to the increased stress in the present day teenager’s already cooked up life. It also pinches heavily on the parent’s wallet. With every passing year, the marketing companies, media and the social media hypes the event and the pressure on the teens will surely keep increasing. Excellent article , especially for those from different culture, to know exactly what preparations go behind such an event. Balle Balle – good rehersal – You should hve gone to Canada instead of Sainik School ….? Quite interesting. Yes, we did go to the wrong school. Even if we had been the right school, we could not afford it in the 70s.